Before the French Revolution there were about 14,500 looms and 28,000 workers in the textile industry in Lyon. One of the most famous names in the silk industry. They were succeeded by Tassinari Chatel in 1870. In 1829 they supplied fabrics for decorating the house of the bankers Schickler.See bed panel for the Louis XVIII bed room at Le louvre. One of the rare silk manufacturers with roots in the 18th century that still exists. Founded in 1752 by Pierre-Toussaint Dechazelle, Prelle specialized in the weaving of silk drapery and upholstery fabric. The most famous example of their work can be found in the summer room of Marie-Antoinette or in the Marie-Louise bedroom in the royal palace at Versailles. Founded in the early 18th century they were a main supplier of silk fabrics to the Royal House from 1742 to 1783. They specialized in spinning silk thread. In 1834, 650 people worked in their factories in the towns of Roman and St Vallier. Paul Chartron, born in 1828, was not only the manager of Chartron père et fils et Monnier, but also an important shareholder of a coalmining company and one of the founders of Credit Lyonnais. One of the important names in the 18th century. Bissardon formed a parnership with Jean-Francois Bony, the exquisite flower painter of Givors. From 1815 to 1880 the average annual rate of growth of the textile industry in Lyon was 4%. For a large part of the 19th century the textile industry in Lyon was more of a craft industry that an industrial one: in 1875 there were only 7000 mechanized looms in Lyon (about 20% of the looms). There were three times more looms in the back country than in Lyon itself. 80% of the production was exported out of France. Before the American Civil War about 50% of exportation was destined for the United States. One of the leading textile companies in Lyon in the 19th century. 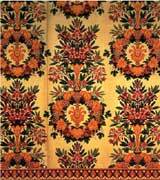 Francois Barthelemy Arlès, born in 1797 of a poor family, started his career by selling textiles in Germany. He was hired in 1820 by Maison Dufour Frères, a Huguenot company based in Leipzig Germany. He married Pauline Dufour in 1824. In 1825 they settled in Lyon where Dufour Frères had a commercial branch and they created Arlès-Dufour. In 1859 his two sons took over the business in the name of Société Arlès-Dufour & Cie. Between 1860 and 1882 the sales volume doubled to reach 76 million. In 1885 the company went bankrupt. A new company that took over part of the assets of Arlés-Dufour was created by Mrs. Morel, Bizot and Chabrières. This company still exists in the name of Morel-Journel et Cie.
Claude- Joseph Bonnet started his silk business in 1811. In the beginning he subcontracted the whole fabrication to small workshops but in 1835 he decided to build his own factory in the country at Jujurieux. In 1869 Cyrille Cottin and Antoine Richard, the grand-sons of Claude-Joseph Bonnet, took over the management of Les Petits Fils de Cl-J Bonnet. 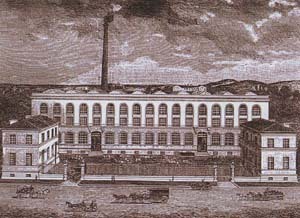 In 1880 they acquired mechanical looms for their Jujurieux factory. Louis Cottin and Joseph Richard succeeded their father in 1892. Born in Nantua Thomas Gindre launched Gindre & Cie in Lyon in 1820. The first industrial factory in Lyon for the manufacture of fabric was created by his son Claude Gindre. The company specialized in the production of satin. Maison Gindre closed in 1954. Vizille and Condrieu, 1500 workers. Jean Claude Dognin started in 1805 as a small silk merchant and very soon opened a workshop with his wife. He was the first one in Lyon to invest in English mechanical looms. He specialazed in silk tulle and invented elastic tulle . In 1841 Dognin entered into a partnership with Isaac, a lace manufacturer in Calais, founding together Maison Dognin Fils et Isaac. In 1875 they employed 3000 people. In 1866 Antoine Lamy bought Maison le Mire, a prestigious manufacturer of drapery and upholstery fabric, supplier of many royal courts in Europe. They built a modern factory at " la Croix Rousse" in Lyon in 1881. They hired Eugéne Presle as a chief designer. One of the most admired silk fabric workshops of the 19th century. Theyreceived many international awards. Two brothers , Jean-Baptiste and Paul Martin launched Manufacture de Velours et Peluches Martin in the 1830's. Their factory in Tarare employed 1500 workers in 1855 and 3500 in 1873. For the first 15 years they produced only two different products: plush fabric and black velvet. 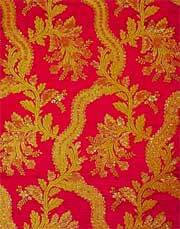 Montessuy started producing high quality silk fabric in the early 18th century. In the early 19th century they built the first industrialised factory that produced crepe in Renage and Vienne.They employed 1250 workers in 1875. They were one of the first tetxile companies with an integrated production from spinning to dyeing. Born in 1815 Philippe Testenoire started his career at Saint Etienne, an industrial town not far from Lyon. Palluat & Testenoire had textile mills in France, Spain, Italy and Lebanon. In 1885, 3500 workers were employed and Palluat & Testenoire was the second most important textile company in Lyon. One of the oldest companies in Lyon that is still active. Francois Payen was a silk merchant in Paris at the time of Louis XV. His elder son, Jean Payen, set up shop in Lyon in the end of the 18th century. In the 19th century they started industrial production of spun thread with factories located in France, Austria, Italy, Spain, India. In the 1880s more than 8000 people were employed by Payen. Today L. Payen & Cie has its base in St Julien en St Alban. As early as 1737 the name of Joseph Monterrad appeared as an important figure in the silk industry in Lyon. His successors, Sébastien Monterrad in the end of the 18th century and Amédée Monterrad in the first half of the 19th century, continued to develop their activities in the silk industry to the point where they were known as one of the most imporatant silk manufacturers in Lyon. Léon Permezel, son of a candle manufacturer, created L. Permezel & Cie in 1870. They were vey successful in designing and producing cloth for a much larger market than the traditional silk industry in Lyon. They never built any factories, operating through subcontractors. They had a very large commercial network in Paris, London, New York, Bombay, Como, Yokohama, Zurich, Barcelone, Melbourne). Founded in 1868 by Cleto Tassinari, Tassinari et Chatel is one of the oldest companies in Lyon. In 1870 Tassinari & Chatel took over Maison Grand, successor to Maison Pernon in the early 19th century. Charles Cordelier took over the silk business of Déchazelle in the early 19th century. He formed a partnership with Marie-Jacques Lemire. They acquired the factory of Chuard, the successor of Bissardon. They were sold to Lamy & Giraud in the second half of the 19th century. They reveived an award at "Exposition des produits de l'industrie Francaise" in 1827 for their crepe and gros de Naples.